Hello everyone, I'm Yvonne aka Meggymay. I leave how you interpret this up to yourselves. How does your garden look, what would you wish to see in the garden, is it a small space, a pot plant... These are some of my thoughts that I jotted down when thinking of ideas. I hope you will enjoy this theme and I am looking forward to visiting you all, to see your ideas and garden pages. Please leave a comment after linking... And have a look at the dreaded rules which you can read HERE. Thank you! You can link as many entries as you want as long as they fit the topic. Only larger artwork in an Art Journal or on Canvas or loose pages - larger than DIN A 6 (105x145mm=4,1 x 5,8 inches) will be accepted. Digital Layouts are welcome as well. ist ihr Thema und wir freuen uns schon sehr auf all Eure Interpretationen - ein sehr vielseitiges Thema, wie wir meinen. Your page is gorgeous and what a lovely theme. I love your tiny pink flowers and darling bird. Beautiful page with the garden-picture, this happy colors and the cute bird! I like this theme, cause in the summer I spend much time in my garden. 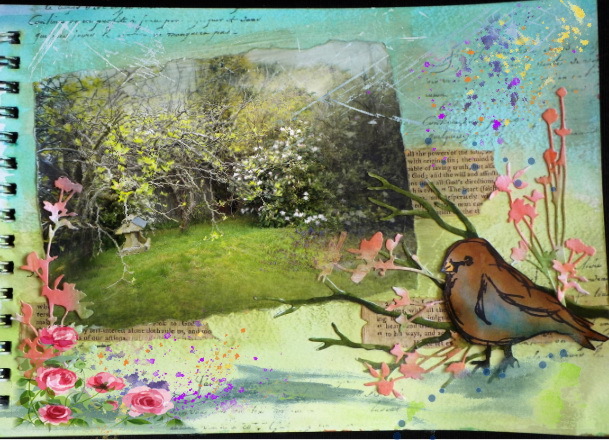 Love your theme, Yvonne, and your painting is fantastic, a lovely Summer garden. Gorgeous summery page, especially with the colours, flowers and cute bird. The garden is one of the places that I send most of my time Yvonne, so your theme is very close to my heart. I can't wait to visit everyone. Thanks for sharing and the invitation to link up. Inspiring theme dear Yvonne and your example looks very nice. Lovely garden photo and you decorated it so very well. The little bird is the eyecatcher. What a beautiful garden piece and I love any themes related with nature and green. I love gardens, so this is a favourite theme! This is a wonderful theme Yvonne. You and your artwork always inspire me. Thanks you AJJ for more fun this month.